This big gold watch ‘St. 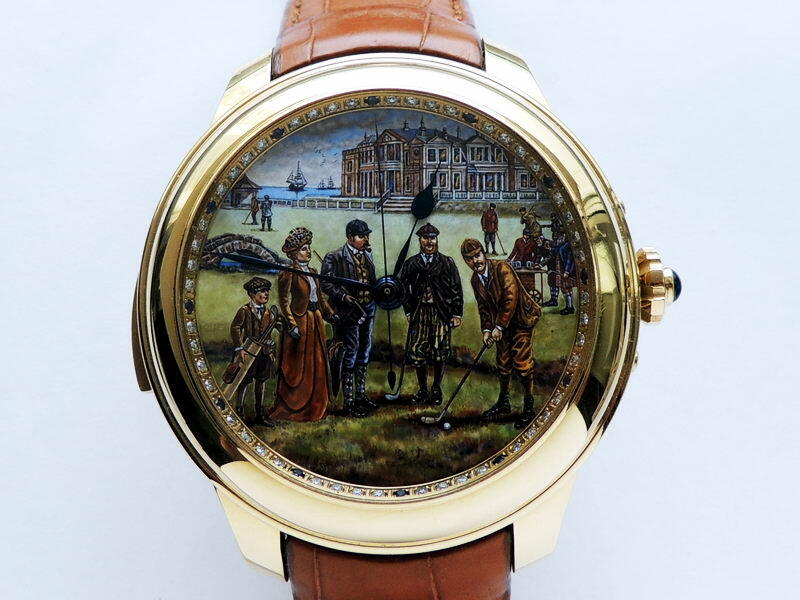 Andrews’ bespoke watch was made upon the customer’s request as a tribute to his favorite UK golf field ‘The Old Course St. Andrews Links’. 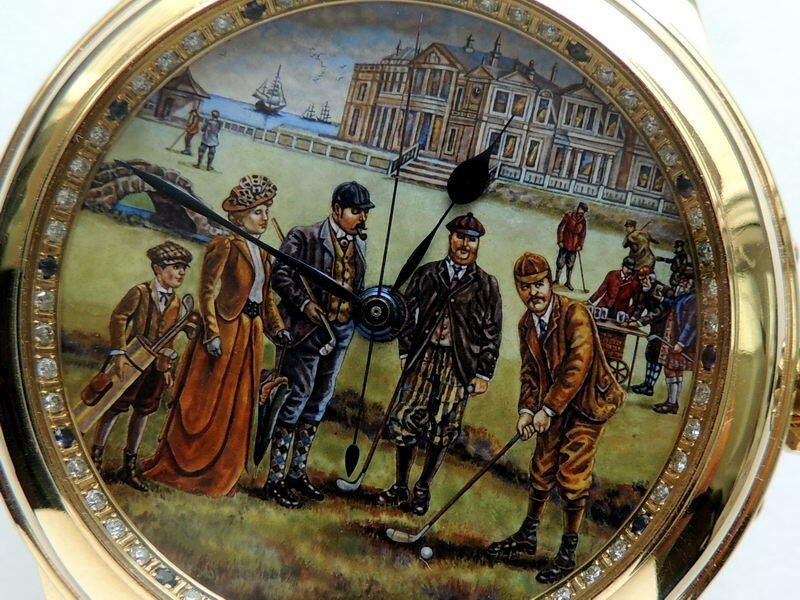 The hand painted hot enamel dial was made according to classic technology based on an old photo of a golf course. 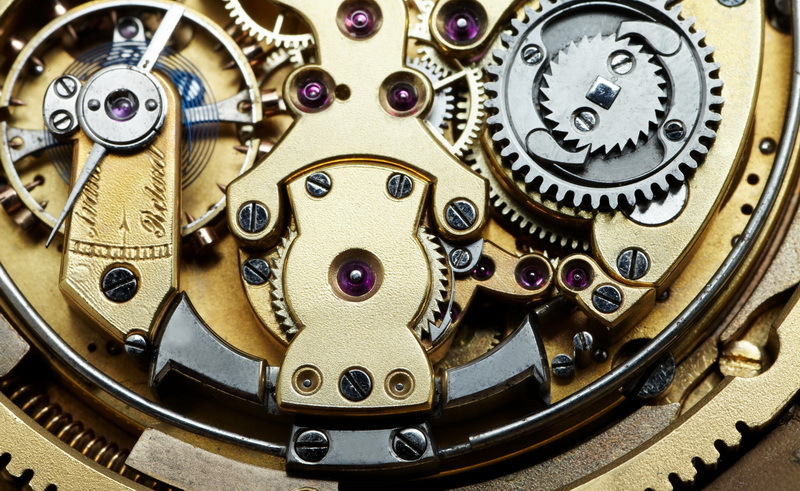 The special and rare pocket watch movement was used to bring life of ticks and dings. The large gold case for a large gents wrist. Rare vintage movement with three wheel trains for time, repeater and jumping second functions. Independent second wheel train allows a jumping second hand that’s sort of like in a quartz watch. The second hand either starts or stops by a button. The quarter repeater is activated by a slider on the case side. Hammers perform single strikes for the number of hours and double strikes for the full quarters in an hour. Due to large size of the movement, heavy hammers and gongs make a deep loud sound. 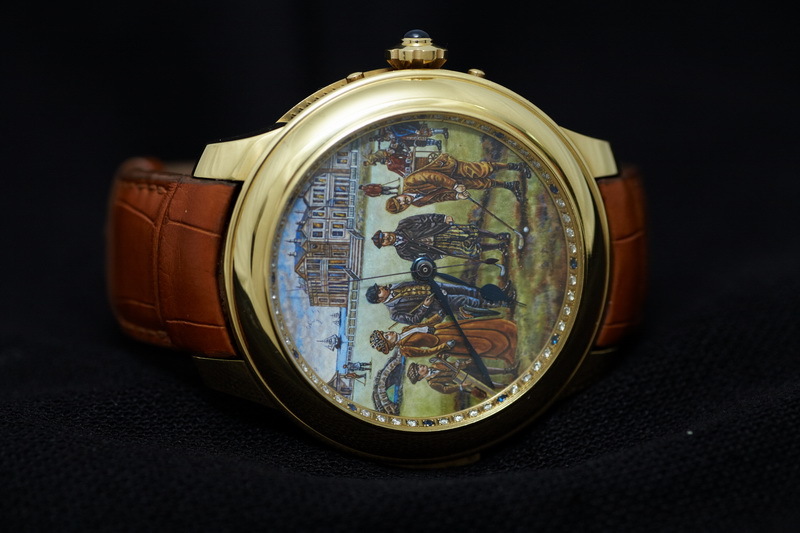 The dial is hand painted, a classic hot enamel technique was implemented. Although the watch was not made for everyday wear, but it’s attractive and suitable for special events. 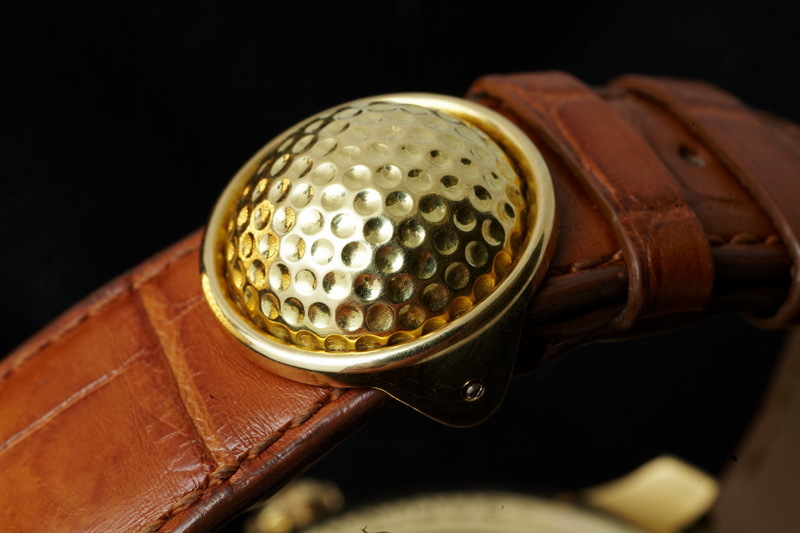 Handmade alligator strap, golf ball shaped 18K gold clasp. 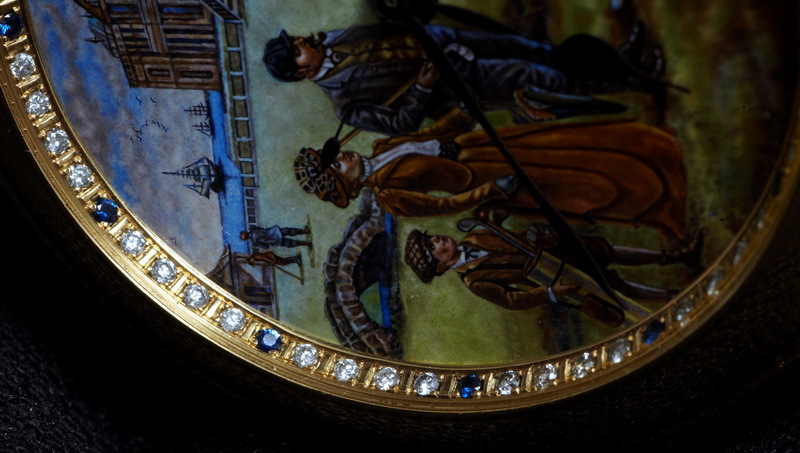 The diamonds and dark-blue sapphires on the rim represent the minute and hour markings. 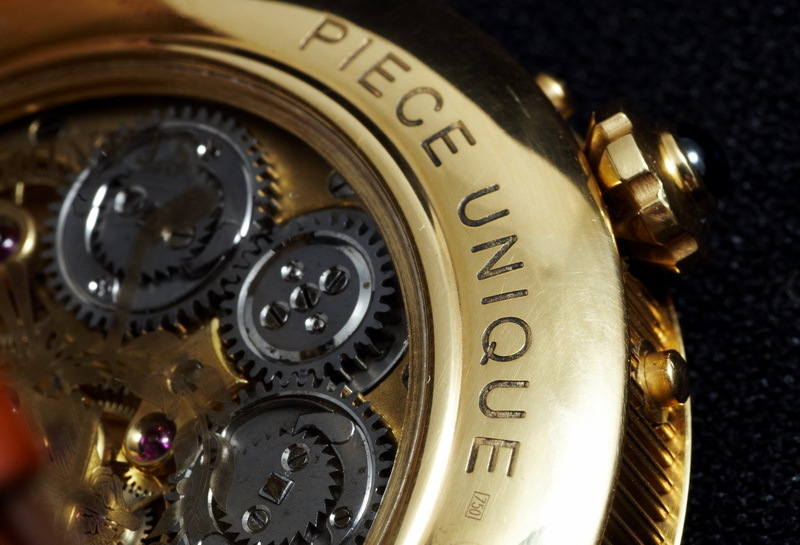 The signature ‘Piece Unique’ shows there is only one masterpiece was made. The movement is a pride for this project. We got lucky to find perfectly preserved pocket watch movement made in Switzerland back in 1880’s. Spectacular finishing with gilt plates and purple ruby jewels. Two spring barrels with Ls. 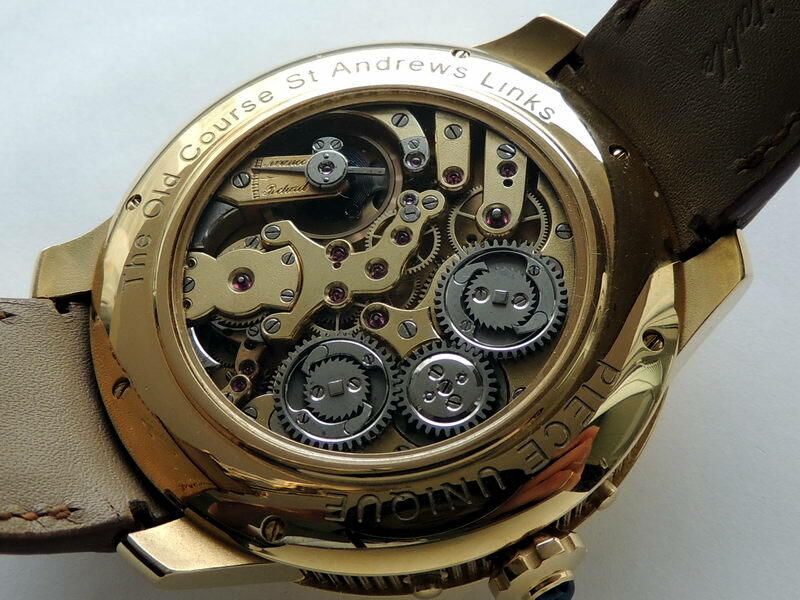 Audemars winding system for the main wheel train and for the independent second. 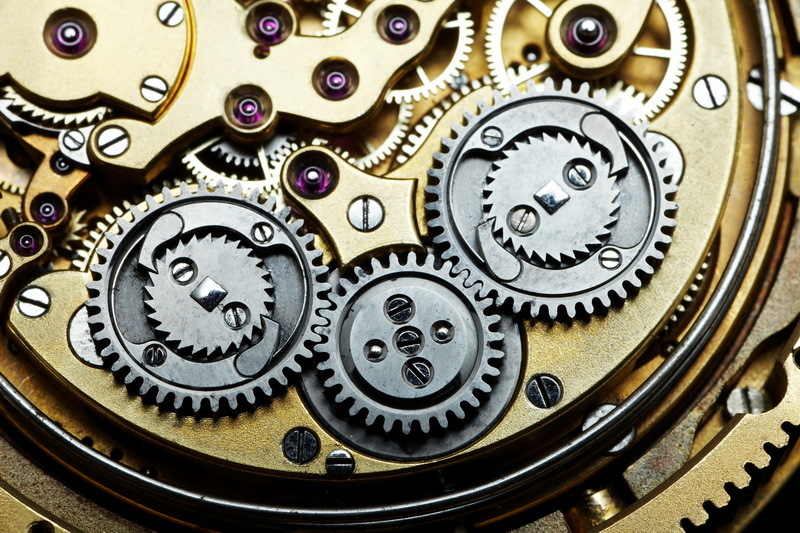 The watchmakers were really trying hard to make the machine comply the highest quality standards, but left it unbranded. 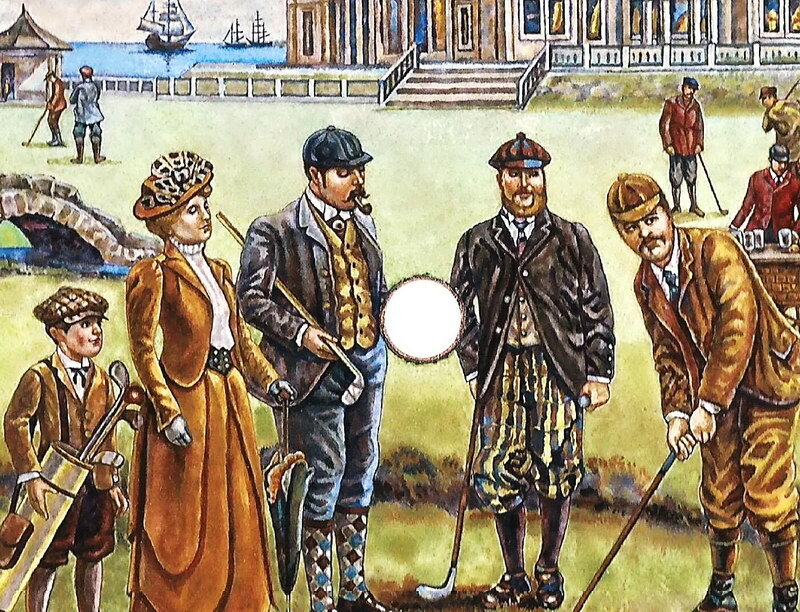 This situation was happening quite often in the 1860-1900s, when the modest Swiss manufacturers were making movements for the jewelry trading houses of Europe. 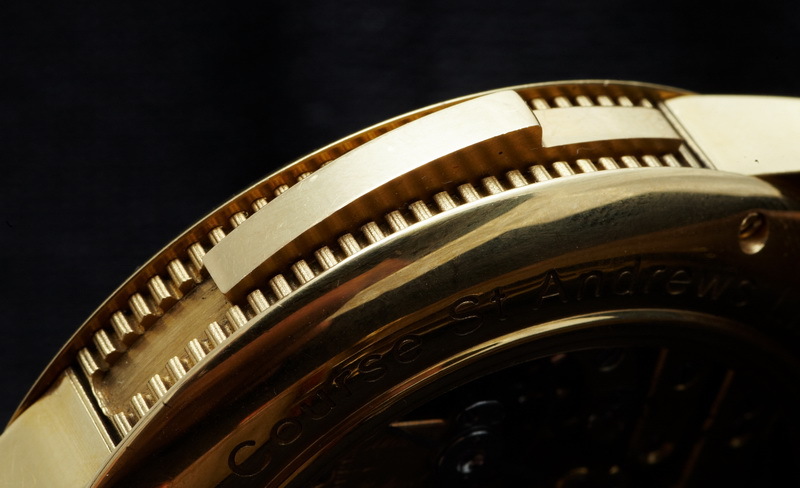 The signature was usually put onto gold case covers, but the case was scrapped for gold at some point, however the movement was preserved perfectly. The third spring barrel with the repeater spring. Hammers and gongs for brisk clear sound. Keep an eye on our updates! If you have any further questions, please do not hesitate to contact us: german.polosin@gmail.com.